From the 1960s through the end of the last millennium, a "10-speed" bike was one with five sprockets in back, and two in front, making ten possible gear combinations. In the early '80s, 6-sprocket clusters came in, and so the 10-speed became a 12-speed. As time went on sprocket clusters with more and more gears were introduced, and gradually the usage for "'N'-speed" changed to refer to just the number of rear sprockets, so a "12-speed" might also be called a "6-speed" disregarding the number of chainwheels. Now that 10-sprocket clusters are in wide use, the term "10-speed" has become confusing as a result. In older contexts, it refers to the classic 5x2 setup, but riders of newer bikes often use it to distinguish their 10x2 (or 10x3) setups from earlier 9x2 (or 9x3) drive trains. See also the "Speeds" entry in this Glossary. ISO 406 mm - 20 x [decimal] This is the common size used on most BMX and folding bikes, many recumbents. ISO 451 mm - 20 x [fraction] -- used on non-folding Raleigh Twenties, British juvenile bicycles, and sportier folding-bike models from Bike Friday and DaHon. This is the size that was used on most older 10- and 12-speed road bikes made for the U.S. or British market from the 1960s through the early '80s. Note on tire/rim compatibility: Traditional 630 mm (27 inch) rims were straight side design, but in the late '70s they evolved to a "hook edge" design which would permit the use of higher pressures. Modern 630 mm (27 inch) tires will work on older straight-side rims, but they won't handle as much pressure as with hook edge rims. Generally, the "rule of thumb" for traditional 630 mm (27 inch) tires is that they should be inflated to 70-75 psi. This shouldn't be a problem with any tire, despite whatever disclaimer the manufacturer puts on the sidewall. However, if you're restricted to this pressure range, you probably shouldn't be running tires narrower than 1 1/8", or preferably 1 1/4" wide, unless you're a very lightweight rider. Back in the '50s and '60s, it was not uncommon to refer to tubular tires as "27 inch" but this was actually an error. The largest size tubular fits 622 mm rims, which correspond to the 700c size. However, in that era, 622 mm clinchers were almost unknown in English-speaking countries. 27" (630 mm) was the closest readily available clincher size, and many cyclists got into the mistaken habit of calling tubulars "27 inch." This has caused a lot of confusion, especially when people try to find "27 inch tubular" replacement tires. Actually, no such size ever existed, it was just sloppy nomenclature. ISO 635 mm - 28 x 1 1/2" This size is something of an antique, mainly seen on classic English Roadsters and Chinese/Indian copies. ISO 622 mm - 28 x [fraction] x [fraction] This is the common "700c" size used on most adult bikes other than mountain bikes and the "twenty niner" size used on mountain bikes. The 28 x [fraction] x [fraction] designation is mainly used in Germany and the Netherlands, and causes no end of confusion. Most of the rest of the world knows these by the French designation "700C"
The ISO 622 mm size is also sometimes known in Canada as 28 x 1 1 /2 F.13. The "28 x 1 1/2" designation is also seen on ancient "single tube " tires. These are seen on bikes from the 1920s and earlier, mainly on wooden rims. They are something like tubulars, but they don't actually have tubes. They're sort of like loops of garden hose, commonly held to the rim by shellac. They could only be patched by inserting a plug from the outside. Monopolistic practices kept clincher tires from being sold in the USA, a substantial factor in the decline of cycling in the USA in the early years of the 20th Century, compared with, for example, Canada. For many decades, 36 spoke wheels were the norm for virtually all bikes not made in England. English bikes used 32 in front, 40 in back, which actually makes a lot of sense, because, it is very unusual to have a problem with front wheels, but much more common to have trouble with rears. This is partly because of the normal weight distribution that puts more weight on the rear wheel, partly because the rear wheel is the one that drives the bike forward. The rear wheel problem is especially severe with bikes that use derailer gearing, because the rear wheel has to be "dished" off center to make room for the multiple sprockets. This is accomplished by making the left side spokes very loose. It results in the right side spokes' carrying most of the load, and the left side spokes' providing poor stability. The English switched over to 36/36 in the late 1960s, mainly to simplify parts stockage. So, as I said, almost all bikes used 36/36 spoking. The exception was a few high performance time trial racing bikes where the builder was looking for any possible place to shave off a few grams. Some of these bikes used 32 spoke wheels. Then, sometime in the 1980s, a clever bean counter at one of the big bike companies had a brainstorm! "What if we were to switch to 32 spoke wheels? Saving 8 spokes would not only save the cost of the spokes, but also reduce the labor cost of wheelbuilding. Multiply the cost savings out by a few thousand bikes, and it can save us some serious money! The beauty part is, that we can cut this corner, even though it will result in more fragile wheels, and then we can present it to the customer as a feature!" This scam was so successful that all of the manufacturers followed suit, laughing all the way to the bank, and the riders suffered the results of the more fragile wheels. In recent years, the same scam has been extended, as the industry tries to see how few spokes they can get away with before the reliability gets so bad that consumers revolt! These days it is common to see mass-produced bikes and aftermarket wheelsets with 24 or fewer spokes in each wheel. These are represented as "premium" wheels, though they generally have off-brand hubs that are a lot cheaper than genuine Shimano or Campagnolo hubs. Naive consumers often fall for this scam, thinking the wheels must offer higher performance due to having fewer spokes. They don't realize that these wheels make up for the lost strength of the missing spokes by using substantially heavier rims! These trendy wheels look lighter than traditional wheels, but they aren't. Some of these wheels are unreliable -- and dangerous because if one spoke breaks, there are too few others to keep the rim stable. Many of these wheels also have nonstandard spokes that can be hard to find when a replacement is needed. An older model, rather unsatisfactory 3-speed hub. A spoke pattern in which each spoke crosses four others that run from the same flange of the hub. A manganese/molybdenum steel alloy made by Reynolds. Say "five-three-one," not "five-thirty-one." This was the uncontested leader in frame materials until the late '60's. Shimano's second-from the top "road" series used to be called "600", then it became "600 Ultegra" and eventually the marketeers dropped the "600" designation. The 1986 600EX group was the second to receive S.I.S. indexed shifting shifting, after original Dura-Ace. Shimano "trickled down" S.I.S. to the 600EX group with a longer cable travel, which became the standard for the rest of the Shimano line. This led to a decade of incompatibility between Dura-Ace and the rest of the Shimano line, only resolved in 1997 when Dura-Ace went to 9-speed and lengthened the cable travel to match the rest of the line. The 6-speed 600EX shifters had an unfortunate design flaw: The indexing unit had 5 tiny tabs that engaged notches in the bushing that fits against the down tube. These little tabs are fragile and by now most of them have broken. They don't generally break all at once, but as they start to go the shifting gets more and more erratic. There is no fix for this except to replace the shift lever. This is a good time to upgrade to 7-speeds or more. Careless or ignorant cyclists sometimes refer to "650" wheels. This short of "shorthand" causes endless confusion. 650 is 597 mm, aka British 26 x 1 1/4" and Schwinn 26 x 1 3/8"
650B is 584 mm, a.k.a. 26 x 1 1/2" (Mostly used on French loaded touring bikes and tandems, but lately experiencing a bit of a revival.) See: https://www.sheldonbrown.com/650b for more on this. As if 3 different terms for the same size weren't enough, now there's a wrong-headed move afoot to create a forth designation for the 584 mm size: Twenty-seven Five! It is really best to use the modern ISO/E.T.R.T.O. designations (590, 584, 571, etc.) to avoid confusion. "High Tensile" (i.e. ordinary) steel. Metallurgical designation for chrome-moly steel. In Shimano road chainrings, "A" designates 42 tooth, "B" designates 39 or 41 tooth. All 42s are "A"s; All 39s and 41s are "B"s by definition. 50s and 52s are all "B" type. Other sizes have no letter designation. If you have poor shifting skills, matching the chainrings by the letters will give very slightly smoother shifting, but if you're a reasonably skilled cyclist, it really doesn't matter. Amateur Bicycle League of America, the former name of the U.S.C.F. A knurled, conical nut, designed to be tightened by the fingers. Similar to a wing nut. The usual use of this term in bicycle usage refers to the nut on the inactive end of a quick-release skewer. 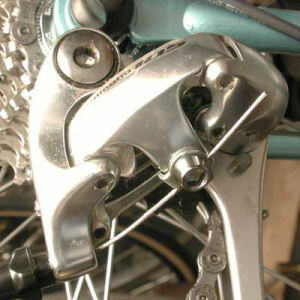 A claw-shaped metal stamping for attaching a rear derailer to a frame that does not have a built-in derailer hanger. It is secured to the dropout by a small bolt with a special-shaped nut that fits in the back of the dropout's axle slot, and also by the rear axle nut or quick release skewer. A hollow bolt, designed so that a gear or brake cable can run down through the center of it, but the housing stops inside the head of the barrel. This allows fine adjustment of cable tension without requiring the use of any tools. Adjusting barrels may be located at the end of any run of cable housing. On brakes, their primary function is to permit easy adjustment to take up the slack as the brake shoes wear down. On gear shifting cables, they help fine tune the indexing. In a conventional threaded bottom brackets, the left cup is adjustable, and its position is secured by a lockring. The right cup is not adjustable, its position is fixed, usually by a shoulder which presses against the side of the bottom-bracket shell. The fixed cup is screwed all the way into the bottom bracket, until the shoulder runs up against the end of the bottom-bracket shell. The bearings of a cup-and-cone bottom bracket are adjusted by screwing the adjustable cup in or out of the bottom bracket shell, and the adjustment is secured by the lockring. See also the Bottom Bracket Glossary Entry and my Tool Tips article on Bottom Bracket Adjustment. The branch of freestyle riding that is mainly concerned with jumps and off-the-ground tricks. Parts or riding positions intended to reduce air resistance. In most cycling, air resistance is the major limiting factor on speed. Handlebars or handlebar attachments that allow the rider to assume a lower, more ærodynamic upper-body position. Most æro bars support the rider's upper-body weight by the forearms, rather than the hands, as with conventional handlebars. Æro bars make possible a significant improvement in speed, but with less secure control of the bicycle. They also eliminate most of the shock absorbency normally provided by the cyclist's bent elbows, so they are not suitable for rough surfaces. They are not usually allowed in mass-start racing. Æro bars originated from an attempt to duplicate the "tuck" of a downhill skier. They first appeared in 1986 when Pete Penseyres introduced them in the Race Across America (RAAM). Although they were an instant hit with triathletes and time-trialists, professional racers were slow to accept this innovation. When Greg Lemond rode Scott æro clip-ons to victory in the decisive final time trial of the 1989 Tour de France, the ice was broken, and few racers will now ride time-trial stages without them. Although æro bars originated as racing equipment, and are particularly associated with triathlons, they have also become quite popular with touring cyclists and randonneurs, as much for the relief that they give to the hands and wrists as for their ærodynamic qualities. Refers to brake levers made for drop handlebars. 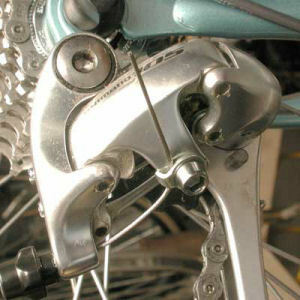 Older designs had the cables exit up from the front of the brake levers, arching over the handlebars. The newer style, where the cable exits out the back of the lever and runs under the handlebar tape, is referred to as "æro" because it eliminates the wind drag of the exposed cables. Æro levers are generally an improvement over the older type. The pivots are located differently, making it possible to get fairly serious braking from the position where the rider's hand is on top of the lever hood. Non-æro levers would permit the use of this position for gentle deceleration only. Æro brake levers usually have more mechanical advantage, which is good in general, but may cause problems when they are used with cantilever or drum brakes that require more cable than conventional calipers. In France, exposed brake cables remained popular longer than elsewhere, because French cyclists sometimes like to transport baguettes home from the boulangerie by resting them crosswise across the brake hoods. The cables help hold the loaves in position. Parts or accessories not supplied from the factory with new bikes (see O.E.M.). This term would include optional accessories, upgrades, and repair parts. The original Dia Compe trademark for threadless headsets. Of all the inventions that came out of the bicycle industry, probably none is as important and useful as Dr. Dunlop's pneumatic tire. Airless tires have been obsolete for over a century, but crackpot "inventors" keep trying to bring them back. They are heavy and slow. They give a harsh ride and poor high-speed cornering on rough surfaces. They are also likely to cause wheel damage, due to their poor cushioning ability. A pneumatic tire uses all of the air in the whole tube as a shock absorber, while foam-type "airless" tires/tubes only use the air in the immediate area of impact. Airless tires are either made of elastomers (rubbery materials) or closed cell foams, which are rubbery materials with lots of tiny air bubbles. The better ones are foam type, because solid elastomers have hardly any shock absorbency. This sort of material has a non-linear response to compression loads: as a compressive load is applied, the stiffness of the material increases as it gets squashed thinner and thinner. The beauty of pneumatic tires is that the compression is nearly linear. A basic fact of physics is that pressure is inversely proportional to volume. Imagine a pneumatic tire that is divided into lots of little segments so that each inch or so of tire is effectively a separate "balloon." Let's say it's 1 inch thick, and when a rider sits on the bike, the tire compresses 1/4 inch. That means the volume of the localized "balloon" is now 75% of what it was before the rider got on, so the pressure in the bubble is going to become 133% of what it was. If the rider hits a bump that compresses the tire another 1/4 inch, the volume will be half the static value, so the pressure will be double the starting pressure. If the rider hits a bump that compresses the tire 1/2 inch (plus the static 1/4 inch) the volume will have been reduced to 25% of the base volume, and the pressure will now be 4 times the base pressure! "Airless" tires that use foam derive their resiliency from the bubbles in the foam, so this describes their general functioning. The bubbles are only part of the mix, though, so a 1 inch thick tire doesn't actually have an inch of air to play with before the bubbles are all compressed as far as they can go. You can only compress the bubbles so much, and the more you compress them, the harder they press back, in geometric progression. Contrast this with a pneumatic tire, where the whole volume of air in the tire is being compressed as a unit. When you sit on the bike, the bottom part of the tire flattens out, say 1/4 inch, but this only reduces the total air volume by a fraction of a percent. Thus the pressure is nearly constant under all conditions, and the tire can be equally shock-absorbent for the full "travel" of its thickness. It is this property of providing nearly linear response to external pressure that is the unique feature of pneumatic tires. It is not possible for any system that doesn't have this feature to give as good ride as pneumatics do. This is why every vehicle designed for road use in the last hundred years has used pneumatic tires. The near-linear response of pneumatic tires is not just a matter of comfort. It also improves traction at higher speeds, because the tires don't tend to bounce as much as harder tires do. Bouncing can cause loss of traction in high speed corners, because when the tire is airborne, it can't have any traction. A peneumatic tire can compress nearly all the way to the rim without any risk of damage either to the rim or to itself. Airless tires do have their applications. They can work well either where speeds are very slow, or where surfaces are very smooth. Thus, they're pretty satisfactory for wheelchairs, especially those mainly used indoors, and also for railroad trains, roller skates, furniture casters, children's riding toys and wagons. Pronounced "alfeenay" as in Italian -- Shimano's name for its high-end series of internal-gear hubs and related parts. More detail on the Shimano page on this site. Frames -- so that the centerlines of all the parts of the frame are in the same plane, at a right angle to the centerline of the bottom bracket; the rear dropouts are equally-spaced from the centerline, the correct distance apart to receive the rear hub, and parallel. Front forks -- so that the dropouts are at a right angle to the centerline, parallel, equally-spaced to either side, the correct distance apart to receive the front hub, and with the appropriate distance ahead of the centerline of the steerer tube (rake) to provide good handling. For adjustment of the spokes of wheels, the word "truing" is used, rather than "alignment". A solid hexagonal bar, usually "L" shaped for leverage, that fits into the hollow hexagonal hole of an Allen bolt head. This tool is sometimes confusingly called a "hex wrench," "Allen key" or "hex key." The terms involving "hex" can be confusing, because normal cap screws also commonly have (male) hexagonal heads, and hexagonal box or socket wrenches fit them. I prefer not to use the term "key" for such a tool. Many languages use the same word for "wrench" and "key", but I believe that it is one of the richnesses of the American English language that it makes this distinction. Since "wrench" is not used in this context in British usage, "Allen key" is acceptable if the appropriate accent is used. One of the nice things about Allen wrenches is that they can be sharpened very easily, just grind the worn part off with a bench grinder, and an old, tired Allen wrench becomes as good as new, so long as you don't let it get too hot while you are grinding it. Strictly, an alloy is any metal that is a blend of more than one kind of metal at the atomic level. In common bicycle usage, "alloy" is usually a synonym for aluminum. A semi-straight style of handlebar popular on sportier English 3-speeds. It resembles a mountain-bike bar with a slight rise, but is usually quite a bit narrower than a mountain-bike bar. Originally, this term applied to any gear system that provided a seriously low gear. One older definition was "anything that used a 36-tooth or smaller chainwheel". The term was also used for a shift pattern that had a very low gear that was a big jump down from the main cruising gears. For instance, my 1957 OTB came with a 14/16/19/26 freewheel. The 14/16/19 gave a pretty good cruising range with the 48 tooth chainwheel, the 26 was for climbing hills (there was also a 30 tooth chainwheel for climbing serious hills). Sometime in the early '70's, advertisers co-opted the term "alpine" and started to apply it to the 40/52-14//28 setups common on mass-produced 10-speeds of the '70's bike boom. As a result, the term became essentially meaningless. Shimano originally publicized this as a way to make older Dura-Ace shifters work with newer Shimano derailers, but it is also useful for other applications where you want to make the derailer move slightly farther for each click. This would mainly be when you wanted to use a 9-speed cassette with 10 speed shifters, or 8-speed cassette with 9-speed shifters, or a 7-speed cluster with 8-speed shifters. Alsternate cable routing also can make the derailer move less far, the opposite effect. Details are given in our article on derailer adjustment. A metal used for many bicycle parts. Aluminum is light and does not rust, though it will corrode if exposed to salt. By weight, it is not as strong as steel, but it weighs 1/3 what a similar volume of steel weighs. Aluminum is one of several materials that are quite suitable for making bicycle frames. On virtually all good quality bicycles, aluminum is used for cranks, chainwheels, rims, handlebars, stems, brake parts and derailer parts. Aluminum is not suitable for spokes, cables, or highly-stressed threaded fasteners in general. Most English-speaking countries outside of North America stick an extra syllable into the word, and call it "aluminium". See also the excellent article by Scott Nicol. They indicate what other stuff is mixed in with the aluminum. Pure aluminum isn't all that strong. Add some silicon, magnesium, zinc, copper, and other things, and the result will be far stronger. If you see things like -T6, following the alloy series, those describe any heat treating the stuff got after it was made. Getting this done correctly is critical to the strength of the frame. For most aluminum frames, it is done after the frame is welded, as the heat from welding will change the metal (usually makes aluminum alloys softer) Heat treating typically involves heating an aluminum frams to near melting (900-1000F), it melts around 1100F, your oven self cleans at 800-850), holding it there for some amount of time (for thin tube, 1/2-2 hours or so) cooling suddenly (dunk in water), then a long bake (8 or more hours) at a lower temperature (like 350F). The different alloys vary in tensile strength, corrosion resistance, welding compatibility, ductility, and machineability. The density of aluminum alloys doesn't vary much at all (under 5%) and the stiffness doesn't change. It's the designer's job to chose correctly among the various tradeoffs. If the designer chose well, even a not particularly exotic material can do the job just fine. Pick wrong, and even exotic super-alloys will break.